Altitude: 2500-3600 metres above sea level. 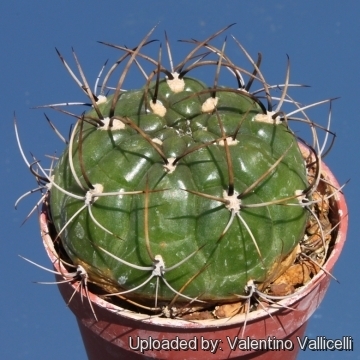 Description: Matucana ritteri (Formerly known as Submatucana ritteri) is a low-growing, perennial stem succulent vaguely reminiscent of Matucana madisoniorum. This plant is a possible relative of Matucana aurantiaca but differing in having fewer spines (8-15) and more ribs (12-22). Habit: Plants usually solitary or forming just a few offsets around the base. Stem: Flattened globose to somewhat elongated especially in cultivation, glossy dark green, 3-5 cm high, 5-10 cm in diameter. Ribs: 12-22, dull upward, blunt up to 1 cm broad at the base. Areoles: Oval, 5-10 mm in length 3-6 mm wide, pale grey and 1-2 cm apart. Spines: 8(-9)-15(-19), at first brownish, reddish black or black, becoming grey, straight to slightly curved. Central spines: 1-2(-5), 20-40 mm long. Radial spines: 7-10(-14), 10-30 mm long. Flowers: Zigomorphyc, oblique, relatively narrow-tubed, vermilion-carmine with violet petals edge, 7-9 cm long, 4,5-5 cm in diameter. Floral tube 4 mm thick, reddish and covered with white flakes. Filaments purple white at the base. Style purple, with 5-6 reddish green stigma lobes about 2 mm in length. Blooming season: Late spring to early summer. Fruits: Shiny red and green, covered with scales and woolly hairs, 10-15 mm in diameter. Seeds: Black 1,2 mm long and 0,7 mm thick. Remarks: Matucana ritteri along with the related Matucana formosa, Matucana inertexta, Matucana huagalensis and Matucana weberbaueri is part of the Matucana aurantiaca group. 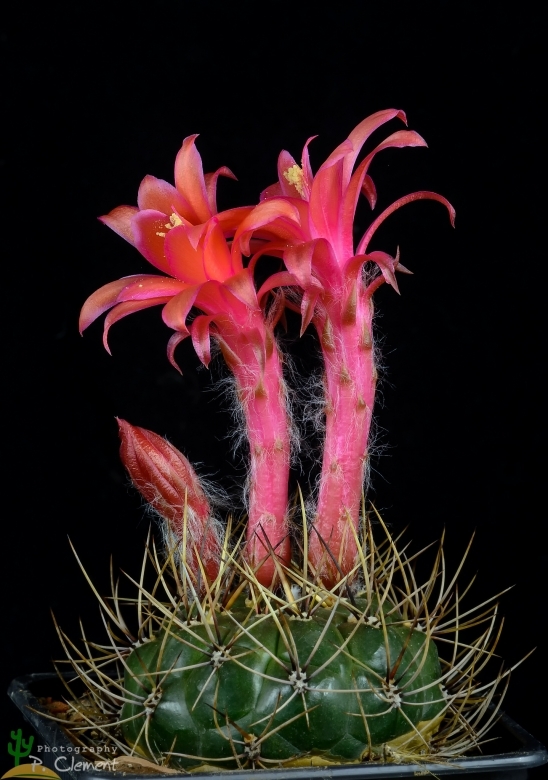 Matucana aurantiaca is variable and many populations have been given separate species names which in the complex forms a group comprising Matucana aurantiaca, Matucana ritteri, Matucana formosa, Matucana inertexta, Matucana huagalensis and Matucana weberbaueri. 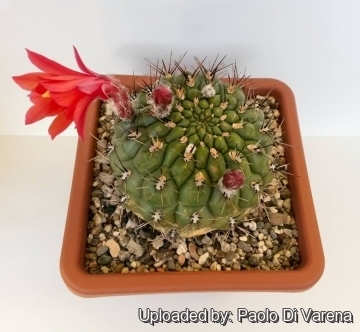 Matucana aurantiaca (Vaupel) F.Ritter: (subsp. aurantiaca) has about 16 somewhat spiralled and tuberculate ribs. Spines 20-25. Flowers orange-red. Distribution: Northern Peru. Matucana aurantiaca subs. currundayensis (F.Ritter) Mottram: Distribution: Cerro Currunday (Otuzco, Samne and adjacent areas), La Libertad department, Peru. Matucana calvescens (Kimnach & Hutchison) Buxb. Matucana formosa F.Ritter: has 20-30 weackly tuberculate ribs, Spines dark brown tipped black. Flowers crimson. Distribution: valley of the Maranon, Cajamarca and Amazonas, Peru. and Rio Crisnejas, Cajamarca, Peru. Matucana intertexta F.Ritter: has 15-25 crenate ribs, Spines dark brown tipped black. Flowers golden yellow with blood red apices. Distribution: Cajamarca, Peru. Matucana pallarensis F.Ritter: Distribution: El Chagual, La Libertad department, Peru. Matucana weberbaueri (Vaupel) Backeb. : has more numerous (25-40) golden yellow or brownish spines and yellow or arange flowers. Distribution: Balsas to Chachapoyas, west side of the Rio Maranon in the department of Amazonas in Peru. Matucana weberbaueri var. flammea (Donald) Slaba: has orange-red flowers instead of yellow. Distribution: Balsas above the Canyon Maronan in the province of Chachapoyas, department of Amazonas in Peru. Cultivation and Propagation: It is a summer-growing species of relatively easy cultivation. This plant is adapted to dry soils and is quite susceptible to over-watering if kept in a non ventilated place. Growth rate: Matucanas grow slowly in their natural habitats, but in greenhouses they grow more quickly. 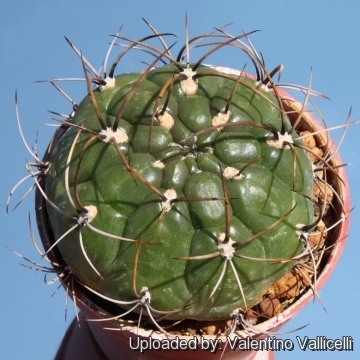 Soil: Grow it in a rich, open, sandy-gritty cactus compost. It needs good drainage and a deep pot to accommodate its tap root. Repotting: Repot in the spring when the roots become cramped. Generally, these plants should be re-potted every other year, in order to provide fresh soil. However, this doesn't necessarily mean they'll need larger containers. After repotting, do not water for a week or more. Exposure: It is suited for sunny-brightly exposure, but can tolerate light shade. However it will do its best only with lots of sun and become stressed with inadequate light which could result in poor growth and unnatural shape. Direct sun is also beneficial in order to get a good spine colouration. Watering: Water sparingly and keep it completely dry during winter. Mature individuals easily rot and die especially after transplanting so be extremely cautious with watering. Keep dry in winter or when night temperatures remain below 10° C. Water it less than average if in bigger pots. Hardiness: It likes warmth (recommended minimum winter temperature 5° C) But plants kept perfectly dry but may to survive a light frost. Propagation: Usually propagated from seeds (seldom produces offsets). The seeds can be sown in pots of fine, well-drained sandy soil, any time during the spring when temperatures are warm. Cover the seeds with a fine layer of grit and water from below with a fungicide to prevent damping off. For the 1-2 weeks cover the pots with a sheet of glass/clear perspex to keep the humidity levels high. Remove the glass and replace it with light shade-cloth and mist once or twice a day for the next two weeks after which most seeds should have germinated. From then on mistings can be reduced to every second and then every third day as the little plants grow. The seedlings should not be disturbed until they are well rooted after which they can be planted separately in small pots.